With this playful nod to the iconic Studio 54, we're creating a disco-inspired wonderland, where you can dance the night away, nosh on food + drink from top Baltimore restaurants, play life-sized versions of beloved '70s games and win super-swanky prizes. Join us on Friday, November 16th 2018, from 7:30 to 11:30 p.m. at the Assembly Room for #Studio410, the 3rd annual Stoop Soirée Gala and Auction to benefit DBFA! General Admission Tickets ($95 each) include open bar + food/drink from our fantastic vendors. VIP Tickets ($125 each) include access to the top-floor Bourbon & Bubbly VIP Lounge, featuring champagne, signature cocktails, and more luxe perks. ONLINE TICKET SALES HAVE ENDED but you can still catch the party of the year. Tickets will be available at the door - November 16th, 7:30 - 8:30 pm - at the Assembly Room. Studio 410 Stoop Soiree & Gala Preview from DBFA on Vimeo. The Downtown Baltimore Family (DBFA) will present its 3rd annual Stoop Soirée Gala & Auction on Friday, November 16th at The Assembly Room. After highly successful galas in 2016 and 2017, DBFA entered into its second decade of working to connect communities and empower families. Proceeds from this premier fundraising event continue to support our mission to work with public and private sector leaders to advocate for quality educational resources, community safety, sustainable transit and public green spaces, empowering Baltimore families to thrive and Baltimore city to grow. Every Baltimorean knows "stoops" are where communities grow. The Stoop Soiree celebrates communities. DBFA works to connect communities and empower families across the city to advocate for great schools, safe streets, and tight-knit communities. This event fuels our work and is DBFA's premier fundraiser. Thank you for your support! Nosh on delicious small plates and desserts crafted by some of Baltimore's top chefs. All attendees will enjoy open bar. VIP Ticket holders will receive access to our upstairs Bourbon & Bubbly Lounge, featuring champagne, signature whiskey cocktails, and more luxe details. Don't miss our amazing auctioneer. If you're persistent, you could walk away with a beautiful hand-painted screen art painted by local legends and city students. We'll also be giving away dozens of swanky prices (think: airline tix; a romantic dinner for two) during our interactive raffle with a nostalgic twist! 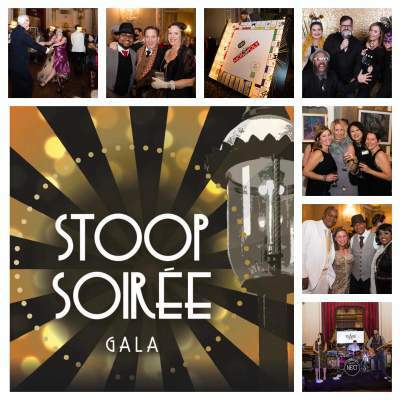 View the pictures below of the 2017 Stoop Soiree Gala & Auction and see why this is one party not to be missed! Not able to make it to the gala but still want to become a DBFA member? We love the support from city families and friends of city families. Consider becoming a member today by clicking here.